Tripod, Sunset and The Lake, originally uploaded by ZackTwin. A friend gave me useful information that a place near to KaRaWeik Hotel is very good to take photo in sunset. 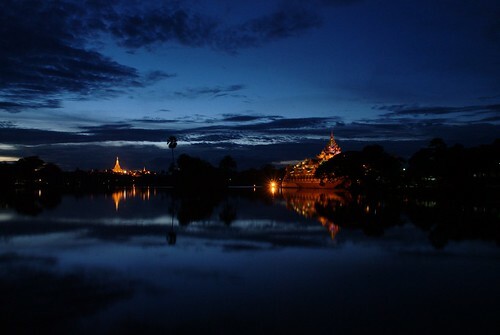 After meeting with some friends, I decided to go to KanDawGyi Lake in an evening even though the time was a bit late. And I didn’t plan to go on that day, so I didn’t bring tripod with me. It’s troublesome to bring a tripod all the time especially you are travelling around the city by taxi. I placed the camera on railing, hold breath, and took the photos. As the result, the photos are not great especially the focus. I am sharing one of the best photos I got on that day.